On An Overgrown Path: What would you do if your homeland was invaded? What would you do if your homeland was invaded? I believe in letting an invader in and then setting a good example. That is the reply Benjamin Britten gave to a tribunal for the registration of conscientious objectors in 1942 when asked "What would you do if Britain was invaded?" I was reminded of it when researching my recent article on Marco Pallis, who was an authority on both Tibetan Buddhism and early music, and, together with Britten, a champion of Purcell. In his best-selling book Peaks and Lamas, which was written in 1939, Pallis tells this story about the Sakyas, the ethnic group of which Gautama Buddha was a member which inhabited the foothills of the Himalayas. News was brought to them of an impending attack by a hostile tribe and it was debated anxiously whether resistance should be offered or not. Eventually they decided that, as followers of [Buddhist] Doctrine, they were debarred from offering armed resistance, but must welcome the invaders as friends, so they threw down their arms... The Tibetans, however, not being sentimentalists, admit that the story of the Sakyas ends as it might very well end in any similar case - every convinced pacifist must face the possibility: the enemy arrived and the Sakyas were massacred to a man, the gutters of their streets ran with blood, and their race was blotted out from mankind. Some people may argue that the sacrifice of the Sakyas was in vain; but, viewed in relation to the law of Cause and Effect, the chain of consequences derived from their brave refusal to compromise, even if all memory of the deed should fail, would add itself to the general store of merit on the cosmic plane, the Karman of the Universe as a whole; and in the second place, as a recorded historical event, the slaughter of the Sakyas, might, by force of example, affect many individual Karmans. To the Sakyas themselves there accrued no obvious profit; that is as it should be. Also we must remember that their own personalities were dissoluble; it was idle for them to trouble their heads with hopes of rewards, or regrets. The fruit of the Sakyas' sacrifice was nothing less than the Enlightenment and ultimate Liberation of all creatures. In his centenary year Britten is being venerated as a man as well as a musician, with, in particular, his role as a pacifist being put under the spotlight. 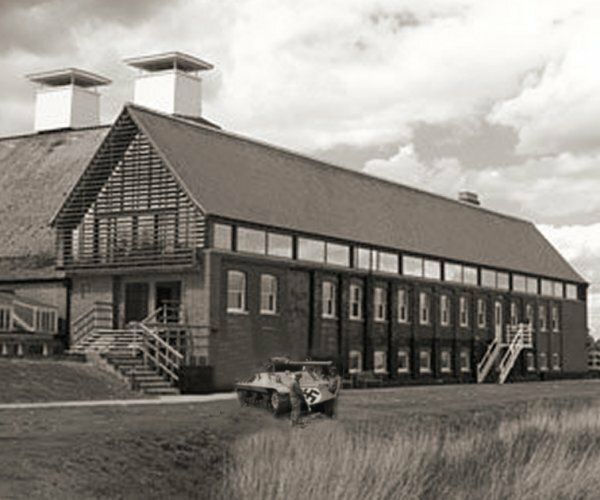 If the Nazis had invaded Britain and others had followed Britten's lead, our dark satanic mills would have been joined by extermination camps. Readers will know I am a great admirer of Britten's music and that I respect his pacifist beliefs which he expressed in masterpieces such as his War Requiem - beliefs which, incidentally, were based on Quaker rather than Buddhist teachings - and I also have a high regard for Marco Pallis' scholarship. But I cannot accept that letting the Nazi invader into Britain and setting a good example would have contributed to the Enlightenment and ultimate Liberation of all creatures. Britten witnessed the full extent of the Nazi horrors when he visited Belsen with Yehudi Menuhin in July 1945. In fairness, the extent of those horrors, or details of how the Vichy regime in Occupied France had "set a good example" by shipping Jews and other "undesirables" to the death camps, was not known when Britten appeared before the tribunal for conscientious objectors in 1942, or when Marco Pallis wrote Peaks and Llamas in 1939 (although the book was extensively revised in 1949). But warnings had been sounded about the potential genocide of the Jews as early as 1935. Significantly, one of the first warning voices was that of Varian Fry, who later masterminded Alma Mahler's escape from Vichy France. Fry had interviewed Harvard educated Ernst Hanfstaengl - who later became Hitler's court composer - for the New York Times in 1935, and reported how he had been told by Hanfstaengl that "that the 'radicals' among the Nazi Party leaders intended to 'solve the Jewish problem' by the physical extermination of the Jews". There were not many voices raised against the Nazis at this time, but Fry was strident in his early denouncements of the Hitler regime which included advocating a U.S. boycott of the 1936 Olympic Games in Berlin. Rosamund Strode, who worked closely with Britten in his final years, expressed the view that "he was a non-political animal, like a lot of artists". But, despite this, it is likely that Britten knew of Varian Fry's prescient warnings about Nazi plans to exterminate the Jews. The composer lived in North America from 1939 to 1942, and Fry was based in New York until he moved to Marseille in August 1940 to establish his escape network. Although there is no evidence that Britten met Fry, the two moved in the same circles in New York. Fry was a close friend of New York Ballet founder Lincoln Kirstein - they had been joint founders of an influential literary magazine while at Harvard - and W.H. Auden had introduced Britten to Kirstein. In 1941 Britten created his Matinées Musicales from the Rossini originals for the New York City Ballet, and dedicated the work to Kirstein who went on choreograph the Frank Bridge Variations and Les Illuminations. Britten's biographer Humphrey Carpenter tells of how at the time of the Munich Crisis in 1938 Britten was experiencing "jitters...over the International Situation", so it seems improbable that he could have been isolated from concerns about Nazi extermination plans circulating in New York's artistic community a few years later. This year we are celebrating the centenary of Benjamin Britten's birth, and composer anniversaries should be times of reassessment as well as celebration. So, based on both research and reflection, my personal position has changed, and I now believe that Britten was brave but wrong in his uncompromising advocacy of non-violence, an advocacy which continued after the horrors of Belsen and elsewhere were revealed. And I hope that this anniversary year will provide others with an opportunity for, most importantly, a celebration of his peerless music, but also an opportunity for an open-minded reassessment of his pacifism. Also on Facebook and Twitter. Header photo montage is my work. Any copyrighted material is included as "fair use", for the purpose of study, review or critical analysis only, and will be removed at the request of copyright owner(s). You final verdict does not appear to leave room for people to follow their own conscience, even if viewed as wrong by others. For many pacifists in WW2, certainly for Quakers, their actions were based on their belief of the teachings of Christ. Britten at his tribunal used this understanding of Christ's teachings whilst at the same time rejecting the divinity of Christ. Many such pacifists I have spoken to would say 'I would rather be killed myself than kill another person'. Many wrestled with the problem of how to deal with Hitler and some changed their mind midstream and joined the army as the only thing to do. The charge against Britten is that he took an easy option. His tribunal gave him no conditions, he could do whatever he wished. This is in contrast to many Quakers who felt the least they could do was to help at the front, and so joined the Friends Ambulance Unit. Thanks for that thoughtful response John. It was not my intention to suggest denying people the right to follow their own conscience. Rather it was my intention to pose the question of what would have happened in the event of a Nazi invasion if the majority had followed their conscience and, like Britten, let the invader in. Surely the role of the artist is to contribute to making the world a better place, not hand it over to dictators? The problem for me is that uncompromising pacifism only works in extremis if practised by the minority, otherwise we end up as part of the Third Reich - hence my post. Several private emails about this post have said "this is a problem I have grappled with for a long time". I think we have to accept there is no simple and right answer to the question of when violence is justified, and when it is not. But I still cannot accept that letting the Nazis into Britain and setting a good example would have been the right choice. If this post serves any purpose I hope it is to draw more attention to the valuable humanitarian work of Varian Fry, who has featured in two previous posts. Varian Fry was a fascinating and brave American who died disillusioned and unrecognised. Bob wrote: "Rather it was my intention to pose the question of what would have happened in the event of a Nazi invasion if the majority had followed their conscience and, like Britten, let the invader in." This feels like a straw man argument. Is there any evidence that the majority held pacifist beliefs? Bob wrote: "The problem for me is that uncompromising pacifism only works in extremis if practised by the minority, otherwise we end up as part of the Third Reich - hence my post." Again, is there any evidence that Britten was not in the minority? You're not arguing that no one should be pacifist, so why is it wrong for Britten to have been? It seems like you're more against him expressing his views on pacifism than his actually being a pacifist. As for the Sakyas, they chose their destiny. They weren't duped into it. Did their choice bare the fruit of universal enlightenment or liberation, as Pallis claims? No, but perhaps their own enlightenment and liberation. Yes, they were extinguished. The Buddhist argument for pacifism is one based on decreased suffering. There is arguably less suffering in a massacre than a battle. Very provocative post Bob. Good work! I've long had an interest in the work of Varian Fry, Bob, so I think you for mentioning him again. As well as Isenberg's books, there is also A Quiet Man: The Secret War of Varian Fry, by Andy Marino, St. Martin's, 1999. Fry is also included in a number of general works on the rescue of Jews. He has been honoured, notably in France and Israel, but those honours came far too late, and the following in part explains why. Fry had to make sure the State Department did not find out what he was doing, for it was nigh on totally anti-semitic. Truly, he was fighting on two fronts. Another hero in the tale was Hiram Bingham IV, an attache at the American consulate who issued thousands of visas, many illegal, for Fry and his rescuees. And so, Fry was indeed in fear of his own State Department, and their, yes, I shall say hatred of him continued after he returned to America. The matter of the State Department and anti-semitism has been well-covered by historians. But I would mention a case less well-known: Canada. There is one book on Canada and Jewish refugees, and its title is chilling: "None is too Many." That is in its entirety a note written by Frederick Blair, appointed by MacKenzie King, the anti-semitic Prime Minister, as Director of Immigration. Blair was a vehement anti-semite who dealt with every Jewish application himself. That note was a reply to the question of how many Jews should be allowed into Canada, of course. He didn't waste words. After seven years of Stephen Harper, Canada isn't even what Canadians thought it was. But perhaps Canada never was what anyone thought it was. And I can't off-hand think of any Western democratic country that tries so very hard to control the arts for political purposes. That's something else that needs a book. Philip, interesting coincidence - I orrdered a second-hand copy of A Quiet Man: The Secret War of Varian Fry by Andy Marino from an Amazon reseller yesterday. Cheapest copies by far were from the States, so it is a four week wait until it arrives - which is a healthy antidote to the immediate gratification of the web. With regard to Brodie's useful contribution, perhaps a distinction can be made between offensive violence, as in the invasion of another country, and defensive violence, as when defending against an invader. For me offensive violence, as in Iraq and elsewhere, is difficult to justify. But defensive violence, as in the battle against Hitler, can be justified. But I accept that the dividing line between offensive and defensive violence can be very difficult to draw. For famous men have the whole earth as their memorial: it is not only the inscriptions on their graves in their own country that mark them out; no, in foreign lands also, not in any visible form but in people's hearts, their memory abides and grows. It is for you to try to be like them. Make up your minds that happiness depends on being free, and freedom depends on being courageous. Excellent blog. Just tuned in. Listening to Jonathan Harvey's string quartets. I'm hoping you're right about the classical music business "wising up," and reassuming its celebration of, and adventures within, the complex mysteries of existence. P.S. I prefer the term "wising-up" to "dumbing-up," which seems, well, dumbed-down.